Yu Go Club: A great Go Article for those who are about to start. A great Go Article for those who are about to start. Not only in the game of Go, but many articles out there are written by people who hardly knows about what they are writing. 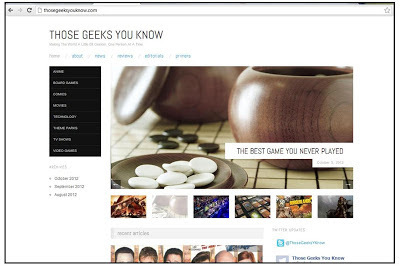 This is an Go Article of a Go player, by a Go player, for the player. Former Yu Go Club member, Ari Margo, is the writer of the article "THE BEST GAME YOU NEVER PLAYED" in the http://thosegeeksyouknow.com/.